One day you might see this 13-year-old on the stage or screen. Damon -- who’s in foster care hoping to be adopted -- has a laid-back personality that shines. “I’m outgoing. I’m athletic. I’m funny. I’m nice, and I’m smart. And I like school,” he said with a smile. Basketball is what he likes to do in his spare time. Damon likes to go to the YMCA to play all kinds of sports. “My favorite meal is probably pizza,” he answered when asked about the kind of food he loves. “On my perfect day, first I’d wake up and probably have pancakes. And I will go to school. Then after that, I’ll probably play basketball. I don’t know. That would probably be it,” he chuckled. He also enjoys reading superhero books and watching movies based on them. Writing and math are among his favorite subjects in school. “Damon does well academically and has adjusted to high school with ease,” his worker said. Theater is an activity that speaks to his heart. “If I could travel anywhere in the world, it would be California or Hollywood,” said Damon. But being adopted is at the top of his wish list. “With a family, I’d like to do sports and school work and hang out and go to the movies and do activities,” he said thoughtfully. If you’d like to read more about Damon, click here. 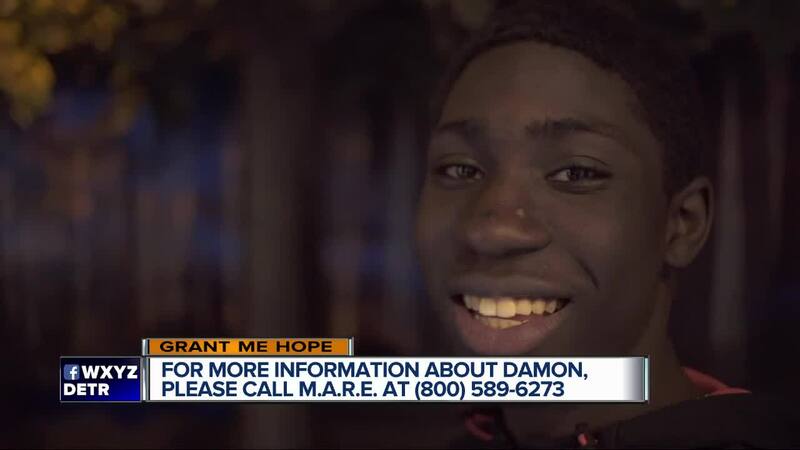 If you’d like to learn more about fostering or adopting Damon, call the Michigan Adoption Resource Exchange at (800)589-6273. You can always help by sharing his Grant Me Hope video on social media. Thank you in advance!